It is really cool that we live in the epoch of modern technologies and social networking sites. They really simplify our lives. Nevertheless, there are some negative aspects of this issue. We mean the work of filmmakers. These days, the cinema industry suffers from “spoilers”, the situation when the main plot of the film is disclosed at the stage of shooting. The information is disclosed and the film becomes not interesting for the audience. This is a real problem of the modern cinematography. The Irish securing company G4S, specializing in the delivery of security services was offered to secure several movie sets. Its overriding goal was to protect movie sets from unauthorized penetration of unauthorized persons in the North Ireland. 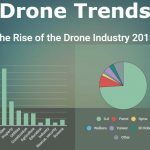 The representatives of this company confess that this problem is exacerbated by the rapid development of the popularity of drones. Modern drones are empowered with professional cameras, allowing its users to get the professional photo or video materials. Besides, these devices are cheaper now and that is why more and more users buy them. The owners of drones try to find out the information about the details of filming, offending against the law. It is strictly prohibited to use drones in some places and situations. Nevertheless, it doesn’t mean that they follow the rules. They learn where the film is going to be shot in advance, go there and use any method to shoot the material and sell it to mass media. This is just one more method to earn money for them. Each day this issue is going to be more and more pressing. As a rule, people ignore all prohibitions and use drones with the aim to shoot in prohibited places. Besides, several years ago, the incomplete version of a famous thriller “X-Men” went online. Again, it was shot by drones! That was a big stink in the area of cinematography. Since that moment, different security measures were step up. Now, security companies commit to this problem and use different methods to prevent the secret information leakage. Though such videos are short and it is impossible to see all details of shooting and you will hardly recognize all actors, but you will see in what conditions the film was shot. As far as this a hot-button issue, the security companies try to work out the methods allowing them to prevent the usage of drone-copters. What is the Solution to This Problem? A good solution to this problem is the usage of trained birds. Last year the Dutch police started training eagles to take down drones. They were the first in the world who offered this method of protection against unauthorized drones. 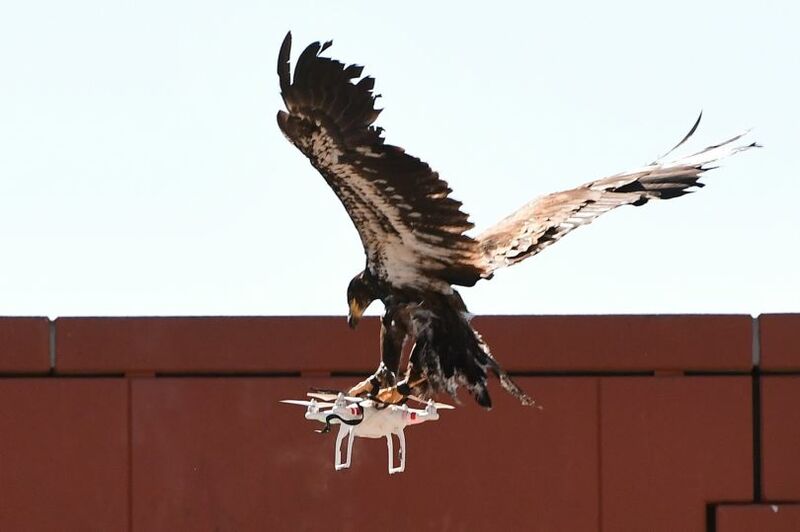 You may wonder, is it possible to learn these kinglike birds to take down drones? How they managed to do this? In sober fact, nothing is impossible! Surfing around the web, you will definitely stumble at a plethora of videos where eagles grab illegal drones out of the sky. Everything is easy. Eagles are very clever and they are taught to see the drones as if they are preys (small animals they would hunt). Then, when the bird sees the drone-copter, it swoops towards it, grabs hold of the drone and flies off. The Dutch police call this method as “a low-tech solution for a high-tech problem”. Drones have lots of advantages. Nevertheless, the police confessed that these devices have a big problem. In some instances, they allow their users to find out the secret information or they may fly too close to airports. So, you see that the consequences may be terrible. Nevertheless, in some instances, the birds may get hurt by the blades. The developers of this method understand it. Now they try to create protecting clothing for such birds. The security company G4S is going to offer the same service to the filmmakers of a popular serial film “Game of Thrones”. They also faced the problem of spoilers and now, they are looking for the methods to protect their work from an unauthorized entry of drones to the movie set. The representative of G4S confessed that they try to choose the best solution to this problem. This is the question of major concern for everyone who works in the area of security. Many people still cannot believe that drone-hunting eagles really exist. 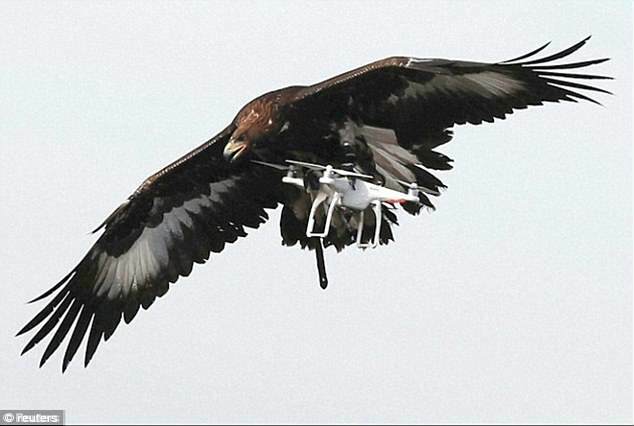 These days, the Dutch police are ready to deploy several eagles that can take down drone-copters. Last year, there was the first public demonstration where the eagles proved that they can easily cope with this task. These days, the Netherlands is the first country which uses this method of taking down drones. We hope that drone-hunting eagles will definitely change the situation for the better. Nevertheless, this situation only proves that drones are a good method to find out the secret information. In some instances, it is really better to ask the permission to use a drone in one or another place (for reasons of safety), but still, there are many situations when drones can save lives, support law enforcement or streamline agriculture management. Besides, drones are still the best method to have access to hard-to-reach places.